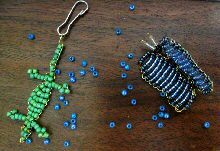 To create a seed bead animal; you first have to learn how to weave. Once you've understood how the technique works, it's easy to put into practice. This activity is suitable for either kids or teenagers. You'll need 40 inches of thread for this small gator. Fold the thread in two and hook it through a ring. Start off with the tail.Thread the first bead along the thread right up to the ring. Pass the other end of the thread through the bead. You've just woven your first bead! Keep on with the other beads in the same way. See the enlarged photos for more details How to weave the feet and legs, which is the hard bit with this type of animal. you can change the color of your seed beads for your gator's body, and especially the eyes. To finish your seed bead animal, make a knot and hide it under a bead. It's easier to thread with brass wire (29 gauge) than with nylon thread because the nylon is more likely to come undone by the time you thread other beads on. The brass wire is harder to tighten but once it's done it won't loosen. To make your own models, first sketch the design on graph paper and choose your colors. This makes it easier to count out the number of beads you'll need when it comes to the weaving. Avoid too big a difference between the number of beads in one row and the one that follows it. A difference of one bead is fine - so think about that when you're drawing up your design! Here's a dolphin , made from a design drawn on graph paper. Keep it symmetrical! (Although you can of course add non-symmetrical elements like the dolphin's fin).